Just about nobody believes Puerto Rico’s official death toll for Hurricane Maria. 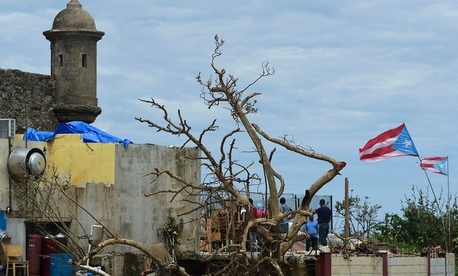 Researchers and journalists alike generally accept that the island’s tally of 64 people killed by the storm last September is a massive undercount, so obviously inaccurate that the Puerto Rican government has agreed to review and revise its figures. But with Puerto Rico still in disarray—from the storm’s casualties, population changes from migration, and the absence of basic services—information on the complete human cost of the catastrophe is still woefully incomplete. A new study in The New England Journal of Medicine, conducted in part by researchers at Harvard University, sheds new light on what’s really happened on the island. The team found that there were over 4,600 deaths potentially attributable to the hurricane, a 70-fold increase over official estimates. The survey also measured high rates of migration among people displaced by the storm and, after it passed, long periods where residents faced a loss of basic services. Official counts are obviously more difficult to perform than my anecdotal one, and not just because of scale: Further complicating the picture are mismatched systems in hospitals and morgues that might double-count some victims or misidentify others, as well as tough decision-making over just what counts as a hurricane-related death. In its survey of over 3,200 Puerto Rican households, the team behind the new study tried to get around those difficulties by asking families directly about the deaths of loved ones. As The New York Times explains, the respondents reported that “38 people living in their households had died between Sept. 20, when Hurricane Maria struck, and the end of 2017.” When extrapolated to the island’s population of 3 million people and compared with deaths from the previous year, the researchers found 4,645 so-called “excess” deaths over that roughly three-month period. The researchers believe even that number might be low because of various biases in their survey, including their inability to measure any single-person households where the person died. Of the deaths linked by household members directly or indirectly to Hurricane Maria, the largest mortality category was people who died from interruption of necessary medical services—about one-third of the recorded deaths. The survey also found a significant degree of storm-related migration, with 3 percent of households seeing a member leave after the storm. Most of the migrants were young, with an average age of 25, and many were destined for the mainland United States. Additionally, many households reported major barriers to basic services like water, electricity, phone service, and medical care. As the Times notes, owing to methodological constraints, there is a rather high margin of error to these estimates, with the low end of the range reaching down to 800 deaths and the high end reaching as many as 8,000. Two other analyses of estimated mortality following the hurricane found just over 1,000 deaths. But while this survey isn’t the definitive count of exactly how many people were killed by Hurricane Maria, what it does show with clarity is that the storm was on par with other recent natural disasters that have shaken the American populace and still reverberate today. For example, the official death toll for Hurricane Katrina in 2005 was just over 1,800 people, and it also kicked off a mass migration of displaced residents. Immediately after that storm, New Orleans lost half its population, and it appears that somewhere north of 100,000 people from the city and its surrounding areas have permanently resettled in the years since. Katrina also fundamentally shaped public policy, sparking conversations on climate change, disaster risk management, environmental justice, racial equality, and class. Beyond raw death counts, the woes inflicted—and uncovered—by Maria are comparable to those revealed after Katrina. As I reported in October, many of the lasting effects of flooding, contamination, and ill health in Puerto Rico compounded along lines of race and class, just as they did after Katrina hit New Orleans. Maria has also shined a spotlight on the federal government’s relationship with its largest territory, further exacerbating one of the most consequential domestic migrations since the Dust Bowl and exposing the future difficulties of austerity on a debt-riddled island. With another strong hurricane season expected to menace the Atlantic Ocean starting in three days, many residents of Puerto Rico still live under tarps instead of roofs. Electricity is still tenuous. And many residents still face barriers to health care left over from last season’s storm. As the effort to measure the fallout from Hurricane Maria continues, perhaps the most alarming implication of that work is that there’s potentially much more damage to come.